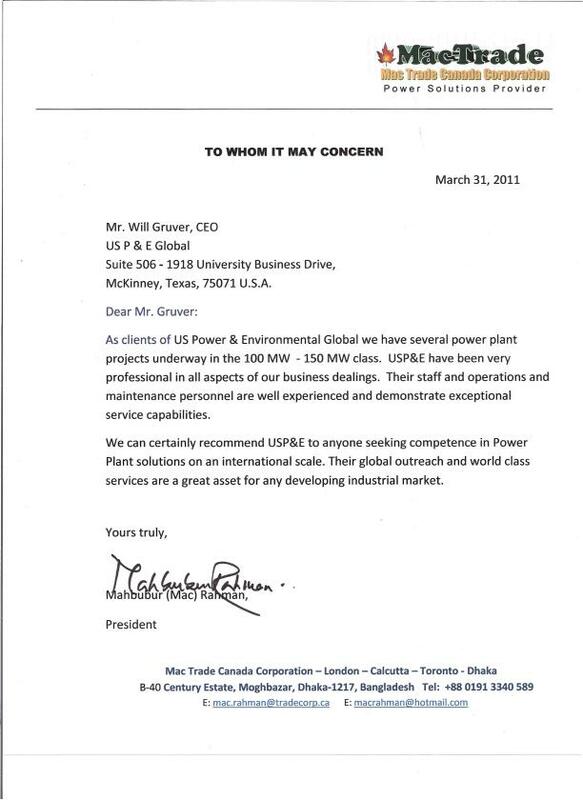 See what our clients have to say about USP&E powerplant and generator services. 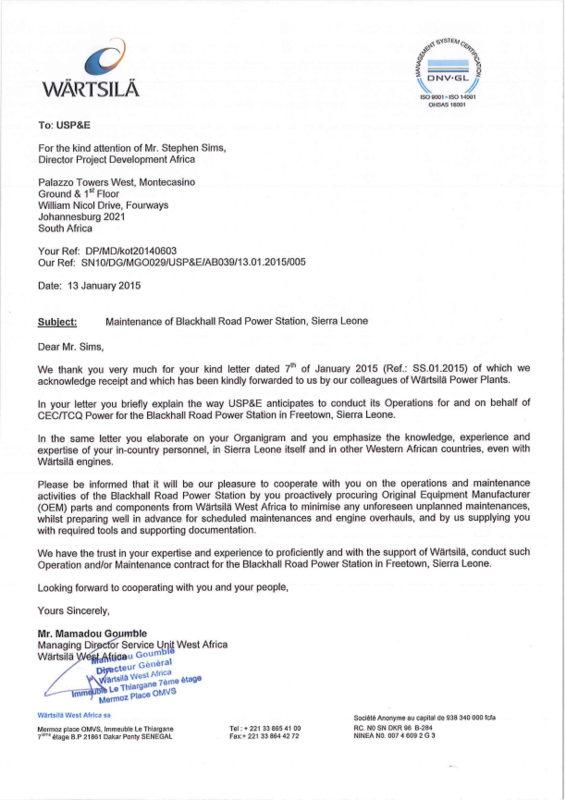 "We have the trust in your expertise to proficiently and with the support of Wärtsilä, conduct such Operation and/or Maintenance contract for the Blackhall Road Power Station in Freetown, Sierra Leone." 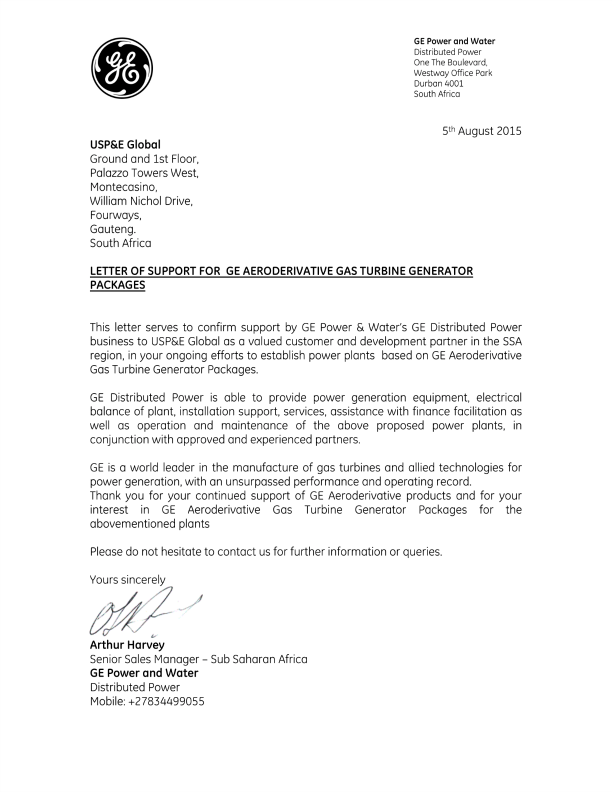 "This letter serves to confirm support by GE Power & Water's GE Distributed Power business to USP&E Global as a valued customer and development partner in the SSA region"
"USP&E and Hyundai Heavy Industries Co., Ltd. are also collaborating on additional tenders and projects in Africa and other locations internationally." "All of the work performed by USP&E has been of the highest professional standards. 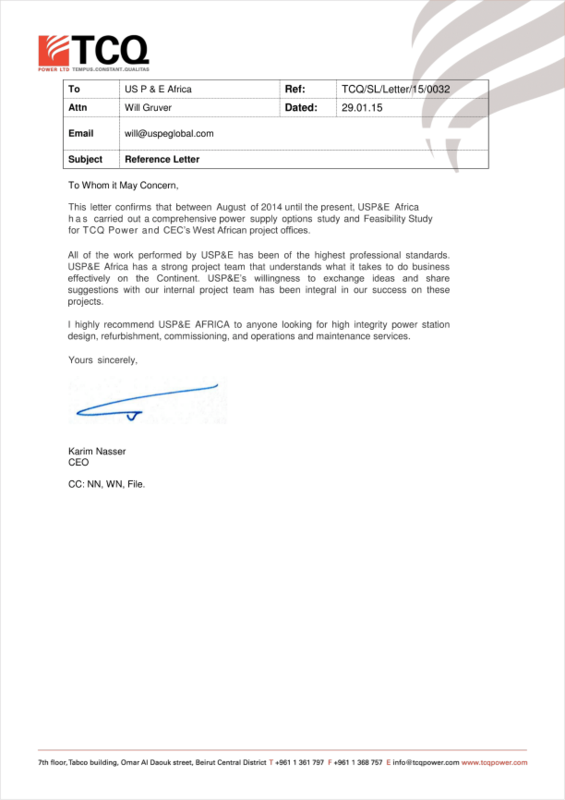 USP&E Africa has a strong project team that understands what it takes to do business effectively on the Continent." "USP&E was diligent and creative in how they approached our project, and were flexible and proactive in ensuring that all aspects of our project were analyzed and considered." 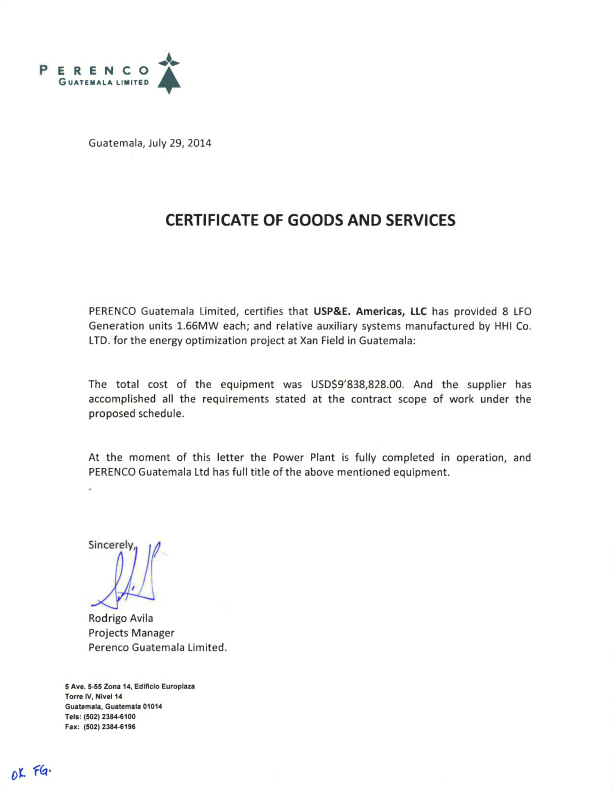 "PERENCO Guatemala Limited, certifies that USP&E. Americas, LLC has provided 8 LFO Generation units 1.66MW each; and relative auxilliary systems manufactured by HHI Co. LTD. for the energy optimization at Xan Field in Guatemala." 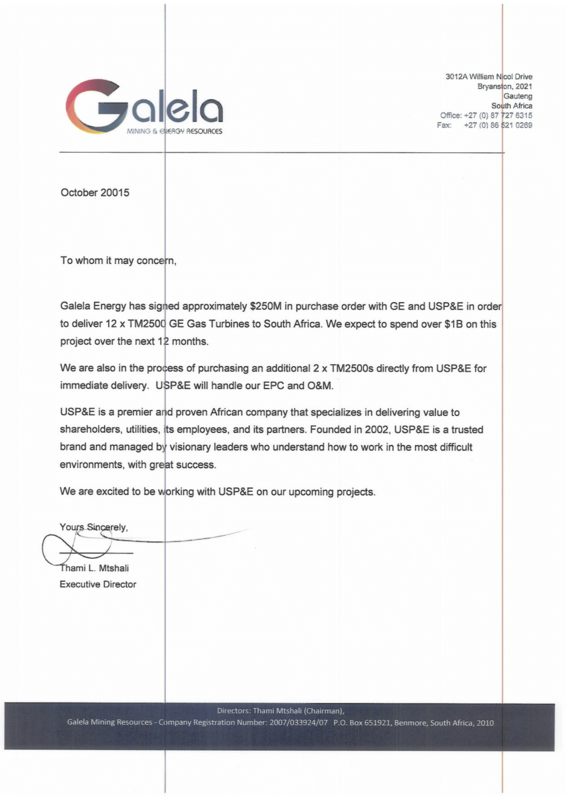 "USP&E is a premier and proven African company that specializes in delivering value to shareholders, utilities, its employees, and its partners." 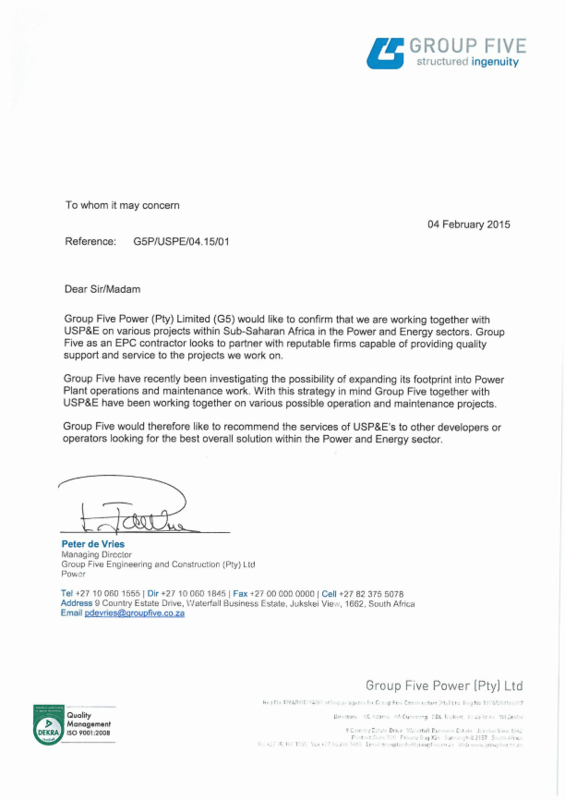 "Group Five Power (Pty) Limited (G5) would like to confirm that we are working together with USP&E on various projects within Sub-Saharan Africa in the Power and Energy sectors." "Our collaborative interactions with the USP&E team have always focused our vision and reduced risks. USP&E is a team that functions in a teachable, open, humle manner where everyone's opinion is heard and results are valued above all else." "All of the work performed by USP&E was extremely diligent and to a high standard of detail and thoroughness." 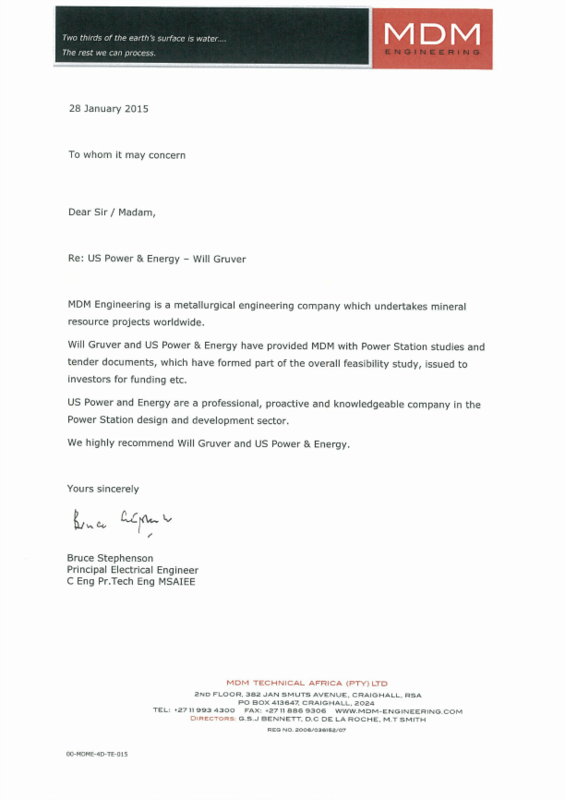 "US Power and Energy are a professional, proactive and knowledgeable company in the Power Station design and development sector." 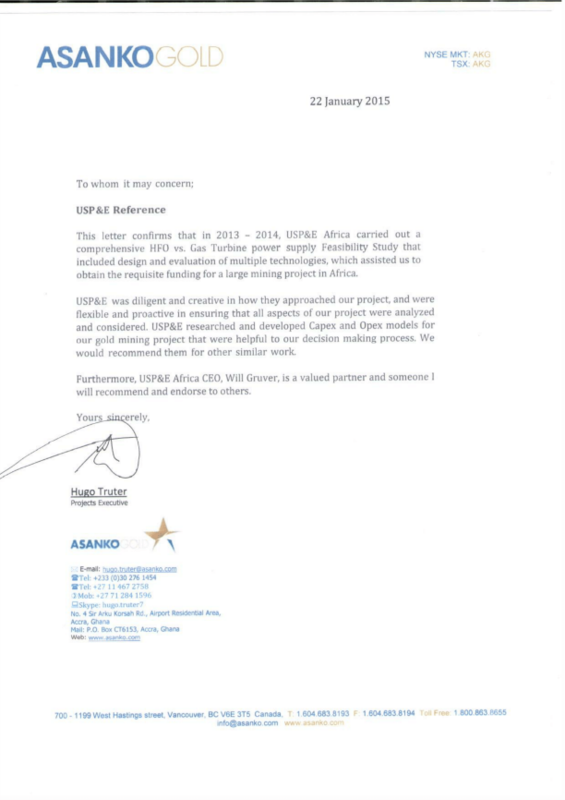 "This letter confirms that in 2014 USP&E Africa provided DRA Projects with comprehensive information to assist us with a Diesel vs. HFO vs. Solar vs. Coal power supply evaluation for a Feasibility Study in Madagascar." 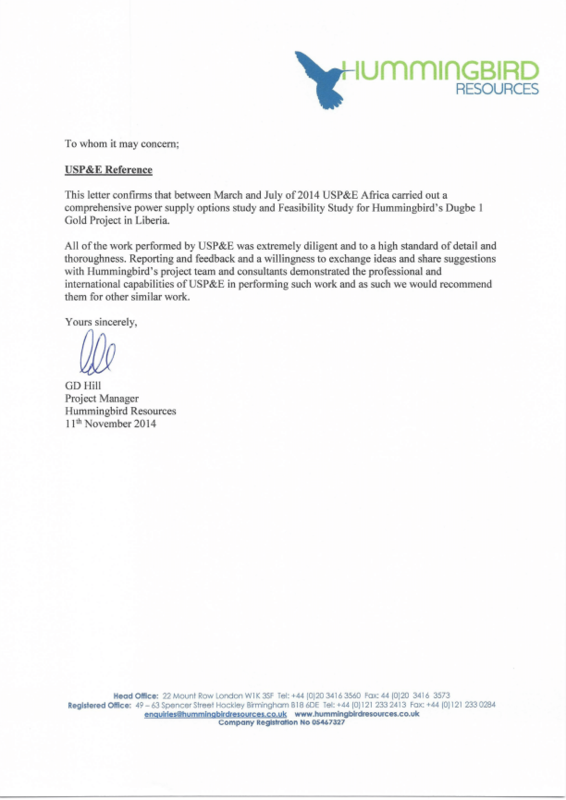 "It is my pleasure to recommend USP&E Africa for both desktop trade off studies as well as downstream construction and implementation of the chosen solution." 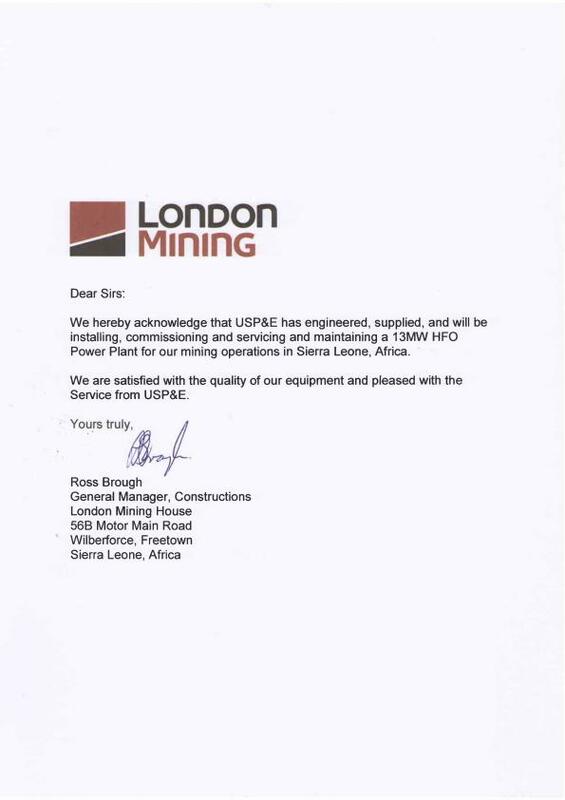 "We hereby acknowledge that USP&E has engineered, supplied, and will be installing, commissioning and servicing and maintaining a 13 MW HFO Power Plant for our mining operations in Sierra Leone, Africa. We are satisfied with the quality of our equipment and pleased with the Service from USP&E." 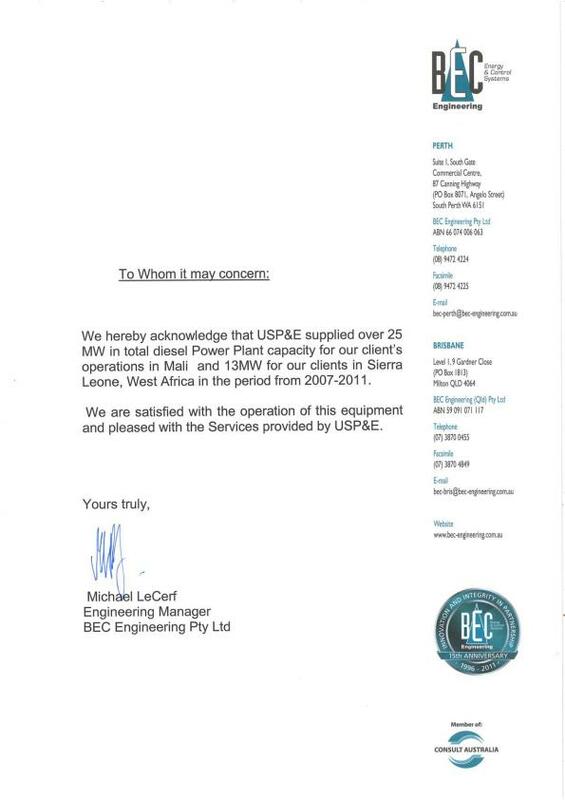 "We hereby acknowledge that USP&E supplied over 25 MW in total Power Plant capacity for our clients in Sierra Leone, West Africa in the period from 2007-2011. 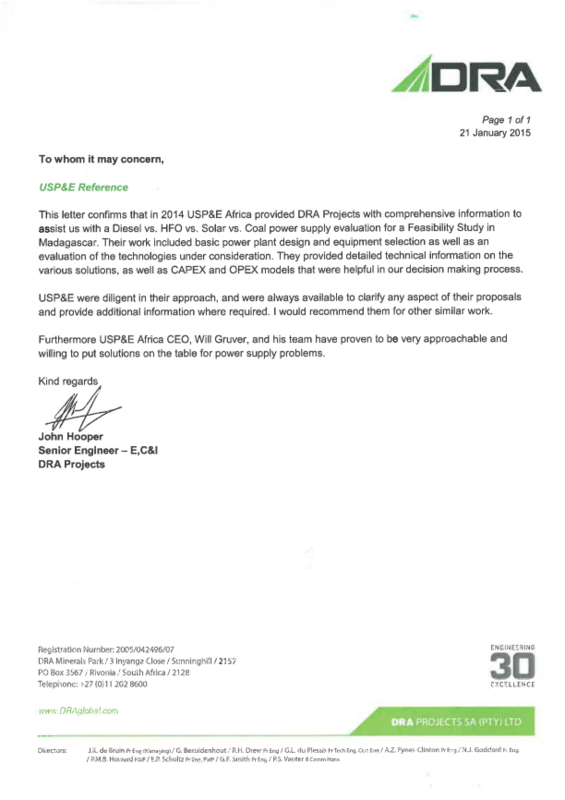 We are satisfied with the operation of this equipment and pleased with the Services provided by USP&E." "We hereby acknowledge that USP&E has engineered, supplied, installed, commissioned, refueled, serviced and maintained over 16,400 MW in total diesel Power Plant capacity for our nationwide US operations as of December 31, 2010. 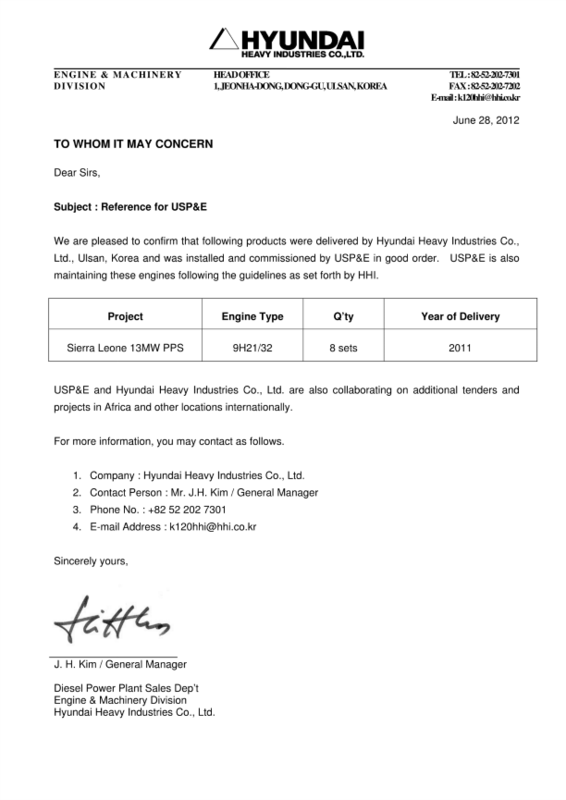 We are satisfied with the operation of our equipment and pleased with the Service from USP&E." 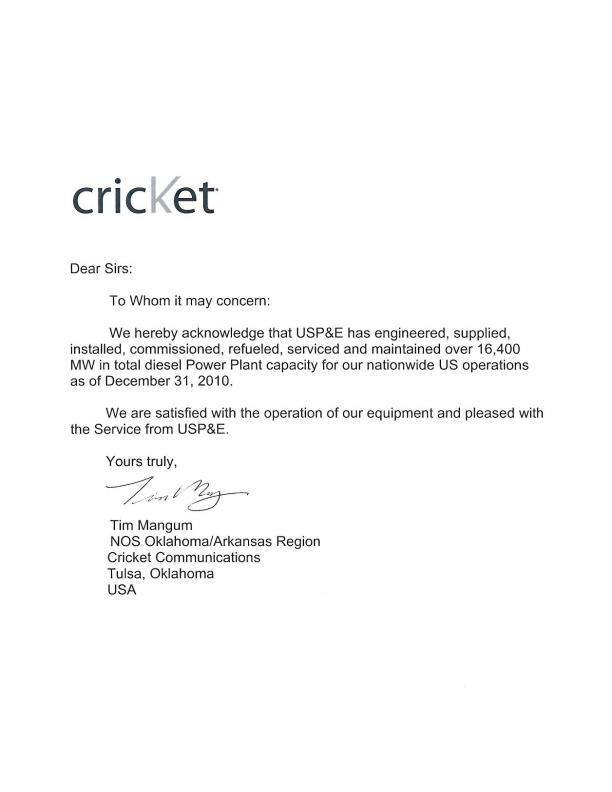 "We would highly recommend using USP&E for any of your projects requiring generators and ATSs, CRAC units and other data center/call center equipment. USP&E has been working with CWT since 2004 at our different locations in various capacities of equipment supply, installation and service. They have always been proactive and responsive to our needs. You can feel comfortable in your decision to work with the team at USP&E." 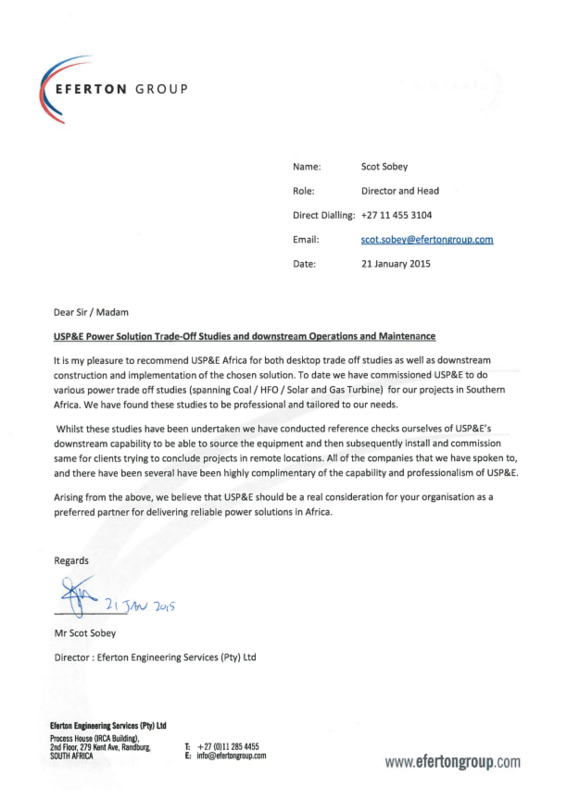 "We are a client of USP&E Global with project totaling over 150 MW and are very pleased with USP&E, their staff, their global reach and operations and maintenance capabilities. 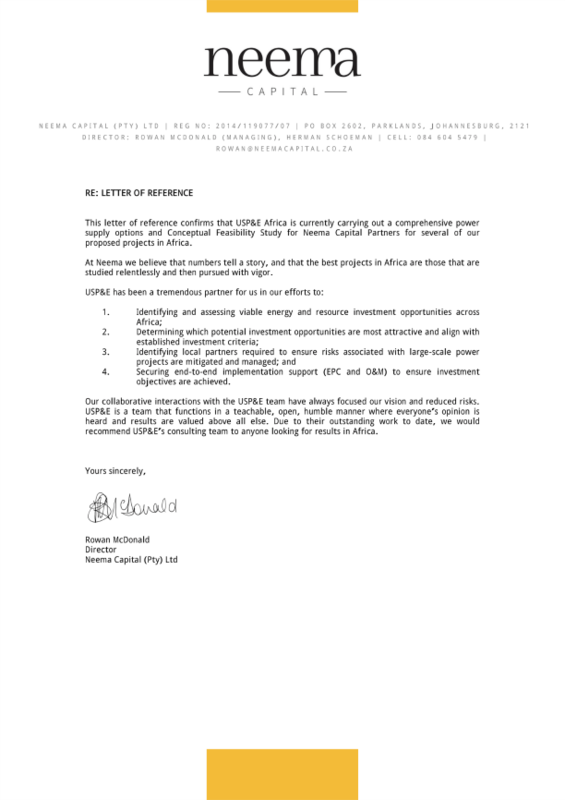 We would highly recommend USP&E to anyone looking for world class services and capabilities in emerging markets." "As clients of US Power & Environmental Global we have several power plant projects underway in the 100 MW - 150 MW class. 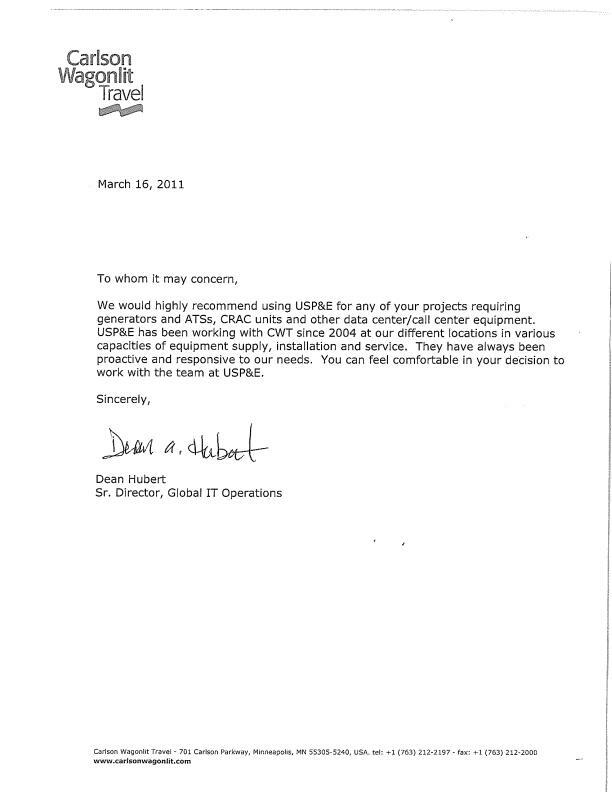 USP&E have been very professional in all aspects of our business dealings. Their staff and operations and maintenance personnel are well experienced and demonstrate exceptional service capabilities. 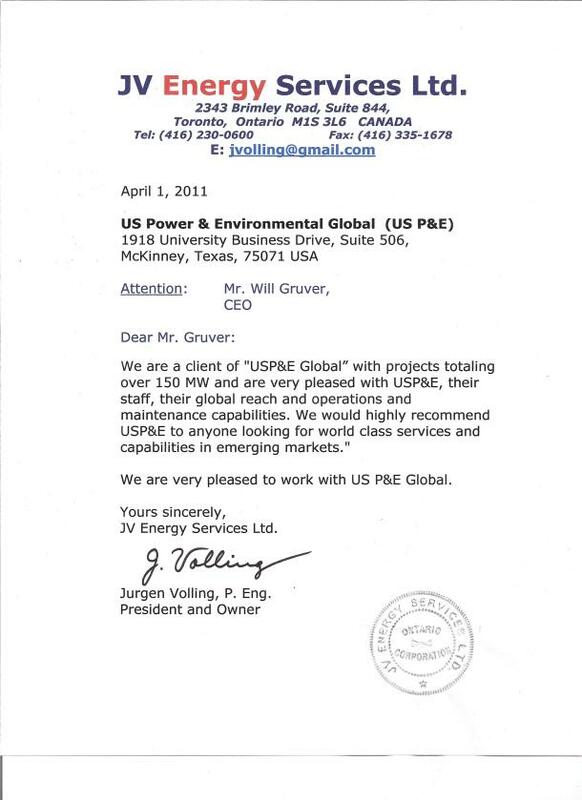 We can certainly recommend USP&E to anyone seeking competence in Power Plant solutions on an international scale. Their global outreach and world class services are a great asset for any developing industrial market." 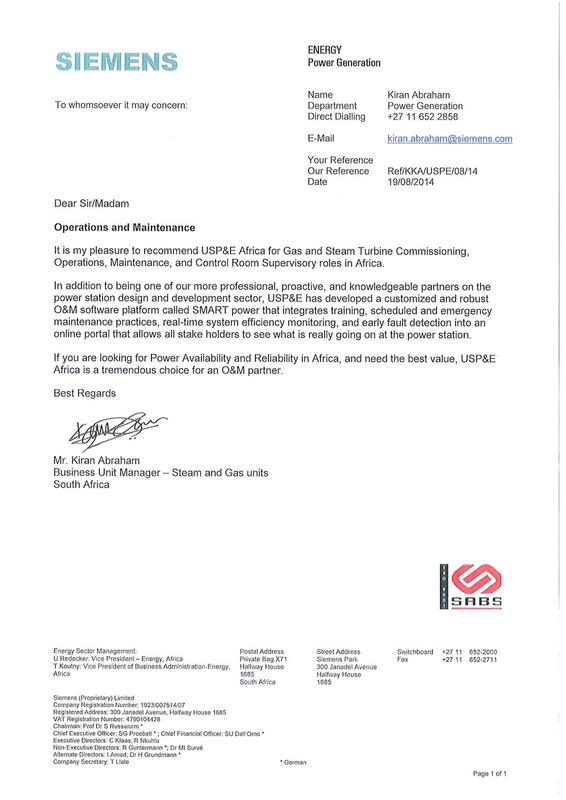 "It is my pleasure to recommened USP&E Africa for Gas and Steam Turbine Commissioning, Operations, Maintenance, and Control Room Supervisory roles in Africa."